To??? Of course… to Patay Gutom! To us! To all Patay Gutoms around the world! If you’re Dead Hungry, then this website and this award is for you! Congratulations to all Patay Gutoms! We won in the 2009 Digital Filipino Web Awards Best Food Website Category! Isn’t it awesome?!?! Yeah! I bet it’s super awesome! What makes this website outstanding? Because they feature different food trips they (Patay Gutom bloggers) experienced as they roam around the Philippines. They as well indicate the price of the featured food as well as the taste as much as possible. 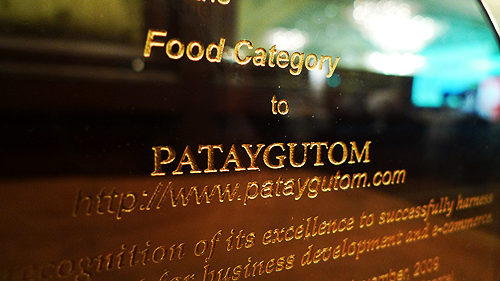 Congratulations also to our fellow Patay Gutom respondents for winning an award in the Digital Filipino web awards. Congrats to My Brute Cheats and Flair Candy. Woooooooot! This entry was posted by Jehzeel Laurente, who has written 19 posts as jehzlau, on Friday, November 13th, 2009 at 8:54 pm and was filed under Events, News. Go PG! Thanks Madelin! ^_^!!!! Congratulations mga ka PG hehe! Thanks for the nom Madz! Congratuations PG! And congrats Jehz! Congratuations.Although the blog name is weird and funny but I like the concept.